Super NES - Bishoujo Senshi Sailor Moon (J), Soul Blazer, Mario Is Missing! Master System - Bonanza Bros. I just felt like increasing the number of front-page thumbnails from three to six. Hopefully that looks okay. Major news, so soon after the last one? Rick Bruns submitted the last maps from Zelda II: The Adventure Of Link, so the NES Game Atlas recreation project is finally complete! 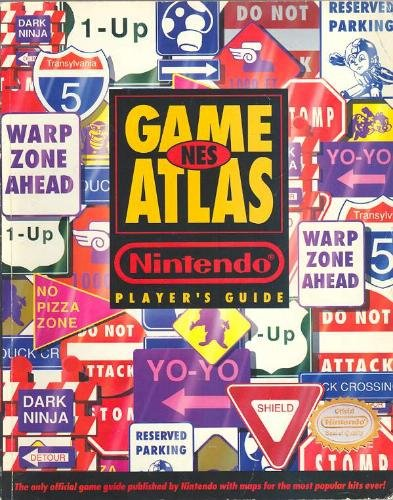 For those of you who don't know, the NES Game Atlas was the first official Nintendo Power Player's Guide. Unlike the Player's Guides from The Legend Of Zelda: A Link To The Past and onwards, continuing to the present day, each of the earliest Player's Guides covered multiple games instead of just one. In particular, the NES Game Atlas had complete maps of the most popular game series on the NES, such as Super Mario Bros., Zelda, Mega Man, and others. It was definitely one of my favourite books in my preteen years and this site has always been inspired by it. And now thanks to all the mappers who contributed, we have matched what that book has covered - and surpassed it, even, by mapping the sequels not covered at the time the book was published! Please see the forum topic on the NES Game Atlas recreation project to discuss these games of which we are proud to have complete map sets. NES - Big Nose The Caveman (Unlicensed), Bubble Bobble: Part 2, Jurassic Park, Mario Is Missing! We haven't had any major news in a while, but this qualifies! With Zeric's submission of the maps from Mega Man 8, the Mega Man series is now complete! For more Mega Man map discussion, check out this topic. NES - Jurassic Park, Mario Is Missing! Super NES - Mario Is Missing! Super NES - Art Of Fighting, Mario Is Missing! Super NES - BlackThorne, Mario Is Missing! NES - Super Mario Bros.
NES - The Little Mermaid, Ninja Gaiden - Episode II: The Dark Sword Of Chaos, Super Mario Bros. Though technically, I'm still unable to update at this time anyway for other reasons. Hopefully I'll be able to have an update of more maps for you guys next weekend. On this lovely 07/07/07, we debut a new section devoted to the Atari 7800. Apologies if there are no updates this weekend. If there is, it might be late and/or small. I'll go into more detail when I can find a moment. It's been a few months since we had a new section, but today we do! This time, it's the atlas page for the Sega Game Gear. Like I said a month ago, any new map of Dracula's Castle (often referred to as Castlevania itself, actually) from a "retraversal"-style Castlevania game is worth a news post all its own. This time, it's from Castlevania: Circle Of The Moon, made by sprays! However, be warned that sprays's map (a 16.1 megabyte .PNG!) might be too large for some of you to view...it's also the largest map (in terms of filesize) that we currently have, wow! I couldn't view it in Internet Explorer, but I could in Opera, so try other browsers if you have difficulty loading it with a particular one. Super NES - Addams Family Values, Mega Man X 2, Pocky & Rocky, Prince Of Persia, Super Smash T.V. I didn't have time to make anything for this occasion, or to do anything special. But I will take a moment now to thank all the mappers who have contributed to this site. Sure, at the very beginning, there was only a handful of my maps. But at some point soon after, the majority of the content was coming in from others, and at this point the site is practically everybody else's hard work. You all made VGMaps.com what it is today: the largest video game map collection on the Internet! So if you have ever made a map and sent it in to the site, thank you! Has VGMaps.com been useful to you in any way? Do you like what you have seen? Are you hoping VGMaps.com sticks around for at least another five years or more? Just want to give birthday wishes? Say so in the forums! Yes, this is definitely worth a news post all its own. Remember when I said that I've always wanted a complete map of Dracula's Castle (also known as Castlevania itself) from one of the Metroid-inspired Castlevania games? Well, Zeric's done it...in fact, he's mapped out the TWO castles in the second GBA Castlevania game, Harmony Of Dissonance! If your browser can handle a couple .PNGs that are over 10 megabytes each, then you should check them out! They're also broken down by area, if the full maps are just too large. Though this was the first "Castleroid" game to be fully mapped, at this point I might as well point out all of the other mapped-out Castlevania games. It may be six months since/to Hallowe'en (about as far from it as you can get), but these are all worth checking out any time of the year! Sometimes things get in the way of other things. You know, like work interfering with weekly updates. There may or may not be an update this weekend. There's a possibility, but I wouldn't bank on it. But if there is, hey, it's a bonus! If you were curious about this year's April Fool's joke, Super Kid Icarus, I've updated this topic with images and an explanation of the processes involved in making it. Oh, and today's my birthday...if anyone cares. And VGMaps.com's 5th birthday is coming up in less than a month! So, how many of you were fooled by the April Fool's joke? If you didn't get it, the joke is that the game Super Kid Icarus doesn't exist. Pit has only starred in two adventures: Kid Icarus (NES) and Kid Icarus: Of Myths And Monsters (Game Boy). Since then, he has only had tiny cameos in other games, such as the WarioWare games, but will finally be playable again as a fighter in the upcoming Super Smash Bros. Brawl (Wii). Pit hasn't had a starring role in years, and an imaginary Super NES game like Super Kid Icarus plays on the notion that Nintendo should've made another Kid Icarus game. Today is March 10, or MAR10, or "MARIO" day! What Mario game are you going to play today to celebrate? Maybe you should hit up some Super Mario World on the Wii Virtual Console; that's what I'm going to do. Apple II - Dangerous Dave In The Deserted Pirate's Hideout! PC - The Monuments Of Mars! A new section again! This week it's an atlas for the Sega Saturn. It's about time we filled in that gap in the Sega console line-up! As I said, I really enjoyed the Video Games Live concert. I have written and put up a review, which is really just a recap of that evening. If you are interested in attending a concert, it may be an interesting read. Well, it's been a while since I put up a new section. And who would've guessed I'd ever put up the start of a Virtual Boy atlas? Now you won't get lost when playing Virtual Boy games, and your retinas will thank you. Man, oh man. Really enjoyed the Video Games Live concert that played here in Edmonton last night. Shame that they didn't play any Castlevania while they were here. But still incredibly awesome. Review to come soon. PC - Secret Agent: Mission One: "The Hunt For Red Rock Rover"
I was over at the NintendoWorldReport (formerly Planet GameCube) forums and stumbled upon an interesting topic. UncleBob is interested in Faceball 2000. I remember seeing this game in Nintendo Power and being intrigued by it. It's about these smiley faces shooting at each other in a maze. It's the only Game Boy FPS, and most particularly, the only Game Boy game with 16-person multiplayer - and he wants to experience it. It's not that easy, as he needs several Game Boys, copies of the game, and link cables to get it all to work. I'd like to see this work. Unfortunately, I don't have anything to contribute to the cause. However, if you do, and want to help out, be sure to let him know. Happy New Year! Nope, no redesign this year. But there will be some changes this year. I'm considering letting Project Wonderful handle my ads. If you sign up for Project Wonderful, you can participate in auctions for ad space with other Project Wonderful members. It's easy to get free advertising, since the highest bid takes the ad space, and bids of $0.00 aren't uncommon. If you have a web site, try it out! I certainly will be.